Whether you’re buying or selling your home, at Keylet we’ll be with you each step of the way. Our experienced consultants will advise and guide you through the property process and save you time and money along the way. If you have decided you would like to own your own home, then you have come to the right place. As local property experts in the Cardiff area, there are ways in which we can help to make the process easier for you. We have put together a First Time Home Buyer Guide, which breaks down the process step by step, designed to help you every step of the way. Before you begin to search for your perfect property, you should have a healthy deposit available in order to take the next step. Generally you need to try and save between 5%-20% of the cost of your ideal home. For example if you like to buy a home that costs around £150,000 you’ll need to save at least £7,500. Saving more than this amount will make it easier for you to apply for a wider range of cheaper mortgages. There are many different mortgage deals on the market, so it can appear overwhelming at first choosing the right one. It’s worthwhile doing your research and check the different mortgage rates and lengths of mortgages. There are many mortgage advisors in the Cardiff area that can assist with the mortgage process and setting up a mortgage in principle. We can recommend some mortgage advisors at this stage if required. Ensuring you can afford the monthly outgoings of the mortgage is one of the most important things you need to consider. It is worthwhile creating a budget of your monthly outgoings, taken into consideration mortgage repayments. As part of the mortgage application process you will need to prove to the lender your income and outgoings. As well as the mortgage repayments, there are other costs associated with owning a home. Including, surveyor’s fees, stamp duty land tax, solicitor’s fees, removal costs, furnishing the property and insurance. Thankfully there are a number of government backed schemes targeted specifically for first time buyers, providing help to those trying to get on the property ladder. You may find a scheme suitable for your requirements and there are many to choose from. Find out about Help to Buy Schemes in the next tab. A freehold is when you own the land the property is situated, therefore if you are buying a house you will more than likely look to purchase the freehold at the same time. On the other hand if you are looking to purchase an apartment, you will be buying the leasehold or buying a share of the freehold. Whether you the property is freehold or leasehold should be on a property listing and if not, this should be one of the first questions you ask the estate agent, so you know what exactly you are purchasing. When you apply for a mortgage, the lender will request information or evidence proving you can make the payments should interest rates rise or your financial circumstances change. You will need to prove your income along with evidence of outgoings including, debts, credit cards, bills and other living costs such as childcare etc. Your mortgage lenders will most likely ask for payslips and bank statements to support this, as well as proof of identification. If you are self-employed, you will be required to provide tax returns and business accounts. If you are finding it difficult getting a mortgage for your first home then you can always consider a guarantor mortgage. A guarantor mortgage is when a parent, guardian or relative agrees to be responsible for the mortgage repayments should you be unable to meet them. Guarantor mortgages should not be taken lightly as they are legally binding arrangements. If you are looking to purchase a property have you considered buying with a partner, sibling or friend? This can be a more economical way of getting on the ladder as there is someone else to share the financial burden with. The finer details of who is paying what and what percentage each party owns should be discussed prior to make any commitments. Help to Buy is a scheme that allows eligible purchasers to buy new build homes with assistance from the Welsh Government. There are two options available, which are Mortgage Guarantee or Equity Loan which means you can potentially move home with a deposit as little as 5%. It is worth noting that if you use this scheme to purchase a home, you are not able to sub-let. These are available to both first time buyers and home movers wishing to purchase any new build homes worth up to £300,000. Buyers will need to contribute a deposit equal to 5% of the property price and in turn the Welsh Government will fund a shared equity loan for up to 20% of the purchase price. Buyers will then need to secure a mortgage for the remaining balance. Should you wish to then sell the property, and you sell it for £210,000, (so a £10,000 increase) you would get £168,000 (80%, based on the mortgage and the cash deposit) and pay back £42,000 on the shared equity loan (20%). You will then pay off the mortgage using the proceeds of the sale and will then repay the Help to Buy, shared equity loan. The shared equity loan comes with a small administration charge of £1 per month. In year 6 the interest is charged at 1.75% per annum of the original shared equity loan amount. After year 6 the interest will increase every year, this is worked out by using the Retail Prices Index plus 1%. These fees do not count towards paying back the equity loan. This is phase two of the help to buy scheme whereby there is more mortgage availability for people with a 5% deposit. The difference between mortgage guarantee and shared equity loans is that with mortgage guarantee it is available for pre-owned properties as well as new builds. Potential purchasers will still be able to prove that they can afford mortgage payments and meet mortgage providers lending criteria. If these conditions can be met and you have at least a 5% deposit saved, then it may find it easier to obtain a mortgage from a lender participating in the Help To Buy scheme. As with most property investments there are risks, one of the biggest risks being the possibility that interest rates could increase. We are currently at an all time low with interest rates meaning that these are going to bounce back, just make sure that you are in a position to still pay off the mortgage if they hit 5%. You purchase a percentage of the full open market value of the property. Unlike your mortgage, there are no repayments due to the housing association. The loan may be paid back voluntarily or upon a future sale. Then pay rent on the remaining share. Shared ownership properties are always leasehold. If you are looking to buy a property, don’t hesitate to contact Keylet Sales and Lettings, where we have a wide range of properties available for sale. We have already handled sales processes in line with the Help to Buy Schemes. There has been a big leap in buy-to-let mortgage lending, and it’s now at its highest since 2007, representing 18% of all new mortgage lending in September. New rules that came in April this year have meant over 55’s get more freedom with their pension pot, resulting in some people are favouring property as it can make a valuable part of a pension portfolio. Although, it is worth bearing in mind that property is a very hands on investment, and even when instructing a letting agent, there are certain rules and regulations you’ll need to follow. At Keylet Sales & Lettings we cover all aspects of the buy to let process so that we can provide you with as much information as you need regarding the rental market, including the supply and demand. Keylet offer a fully experienced Sales team that can help you with the purchase of your buy to let property, and once this is completed and exchanged our resourceful lettings team will be able to advertise your property for rent and manage the property on your behalf. It’s important that before you start looking at properties to purchase for Buy-To-Let, that you are able to raise a deposit and as mortgage rates change, to prepare yourself for gains and losses. Should mortgage rates rise you need to know that your investment will sustain. It is also worth noting the taxes on buy to let investment. On the plus side, a rise in tenant demand and a rise in rents is tempting landlords into investment. Make sure you research the market and compare the advantages and the disadvantages. Is it the right investment for you? Do you know anyone who has this sort of investment, and if you do ask them how it’s going. All these things combined will help you realise whether this market is for you. Before you start your viewings to buy, it is worth putting the figures on paper to see in black and white the kind of investment you should expect to see. Find out how much deposit you will need to pay, and in turn how much mortgage lenders will give you. Also find out the average rent of a typical property that you can afford. Don’t forget to take into consideration property management costs, including maintenance etc. Make sure you shop around to get the best mortgage. Book yourself in to see an independent financial mortgage advisor so you can find the best deals on the market at the time. It will also pay off to do your own research and contact banks and building societies to find out what they can offer you. Make sure you choose an area that has high tenant demand, is there a university nearby that can cater to student lettings? When researching an area, check for things such as transport links, schools and local amenities, as these are all indicators of a sought after area. Who would be your target tenant and what would they require from a property? For example if you are considering student lets they would require, basic layout and standard furniture. For professionals they would want a contemporary space and other benefits like parking etc. For a family, they may be looking for a larger unfurnished property. Rent should be the key return for Buy-To-Let, for example a property delivering £10,000 worth of rent that costs £200,000 has a 5% yield. Again, it is important to note here that landlord expenses will need to be factored in to this. Once mortgage, costs and tax are taken into consideration, the idea will be to build up the rent over time, to potentially use it as a deposit for further investments or to pay the mortgage off at the end of the term. This is an important factor to consider when buying property, how much work will need doing to get the property ready to let? Usually it is the properties that need improvement that have the best chance of boosting their value. Properties in need of repair can be better negotiated, and in turn, once refurbished can gain higher rents, and higher chance of renting quickly. Refurbished properties are desirable when tenants are looking for rental properties. The advantage of a Buy-To- Let investor is that you may not be reliant on selling a property to buy an other, therefore if you are not part of a chain you come with less risk of a sale fallen through, which can be very attractive to vendors and will usually allow some leeway on price. It is also worth knowing the market, online portals such as Rightmove are able to provide indicators of the housing market in the area you are buying, so use this to your advantage. It is absolutely essential that you always research the negative side to any investments. Therefore, should house prices fall, would you still be in a position to maintain the investment. Look into re-mortgaging so you can have idea of what can be done if the rate varies. What would happen if the property sits empty? Whilst tenant demand is high, there can be times of the year where the demand is less. There should also always be money in the bank for any major repairs, new boilers etc. What happens after you buy the property? Will you appoint a letting agent? You will need to consider how well you know residential lettings and whether you have the time and resources to take this on yourself. 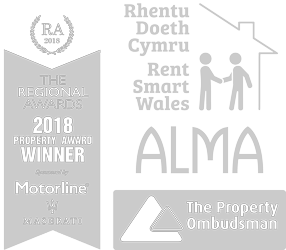 If you are planning to be a landlord in Wales, you will also need to know about the newest piece of legislation, Rent Smart Wales. Most letting agents will come out to the property for free valuations and offer advice, it is worth appointing several agents at this stage and then pick one that best suits you. If you are planning to put your house on the market, it goes without saying that you are hoping to sell your home as quickly as possible as well as achieving the asking price. To help with the sale or let of your property, we’ve put together some of the best home staging advice so that you can maximise the potential of your property. Our experienced team are more than happy to come and meet you at your property where we can offer a home staging service as part of our Sales & Lettings package. Sometimes people may drive pass the property prior to a viewing, to suss out the area as well as the exterior of the property. Some people will make an instant decision at this point as to whether they continue with the viewing you have scheduled. Make sure your home is well-presented to the potential passers-by with power washing the front pavements/driveway, repaint porch, tidy up the garden and de-weed, wash the windows and display easy to read door numbers. You’ll need a welcoming front door, such as a clean doormat and flowers. It’s worth keeping porch lights on in the evenings for any later appointments or for the ‘passers-by’. One of the most important factors when selling a property. If you have pets, arrange for all the carpets, rugs, fabric sofas to be steam cleaned. Keep the pet products out of sight and make sure all pet odours are eliminated. One of the most obvious points, but nevertheless it’s worth mentioning. Although can be a lot of effort, this is the best way to show off the house and should not be ignored! If you don’t have the time, it is worth hiring professionals. Clean and clear rooms are the best, so potential buyers have the opportunity to visualise their own items in the home, and what they can do with the space. It may be worth organising some self-storage away from your home, to help with the clear out. We know this contradicts point 5, however it is worth making the property feel homely, but getting a good balance will really show off the property. Make sure all floors are cleaned at a minimum, it is also worth steam cleaning the carpets, especially if they are a lighter shade. Make sure the thresholds are all tacked down and look presentable. It is also worth noting the importance of rugs, these can be used to your advantage in order to ‘dress up’ a tired looking room. Symmetrical arrangements usually work best. Keep furniture away from the walls and create a social living space, by doubling up on sofas, chairs and lamps. Neutral colours such as beige, cream and stone, should be used throughout the property. People find it more difficult to envisage the property as their own if there is a rainbow feature wall in the living room. At the same time, all white can also make a property look quite clinical and cold. The master bedroom should appeal to both genders, again follow point 5 and point 8, which should help successfully ‘master’ this room. Make sure the bed is made with fresh sheets, neat cushions and blankets for that cosy feel. Show off closest space, buyers find this very important when purchasing a property if they are moving in to it themselves. Again, use self-storage companies if you have to, you should aim to have between 20%-30% open space in each closest to give the best impression of spaciousness. Whilst we appreciate family homes are likely to attract similar families to view the property, it’s probably best that the entire cast of Toy Story goes back in the box. A well organised games room or nursery will be best, and they will appreciate that you’ve taken the time to clear up the space for their benefit. Spare rooms are often one of the hardest rooms to keep on top of, but when you put the property on the market, before the sales agent comes round to take marketing photos, make sure you transform any spare rooms so that they have a purpose. Whether you make it a guest bedroom, office or nursery, make sure it is clear is has purpose. It might be worth thinking, who the potential buyers might be and cater to them. A lot of home staging bloggers mention the importance of considering a pedestal sink to maximise space. The pedestal bathrooms can be really helpful for making a small bathroom look instantly bigger. Take the time to carefully position your items of furniture around the house to encourage a potential sale. Show off the space room by room, take them on a journey, for example something eye catching placed at the top of the stairs will draw people upstairs and keep the intrigued as they explore the property. Artwork, feature wall, flowers can create these sorts of deliberate distractions. The value of your house is dependent on several factors such as, location, size, number of bedrooms, number of bathrooms etc. All these different factors, plus many more, form the valuation of your house. There are a number of online valuation tools available, but for an accurate figure an accredited local estate agent has the best knowledge of the area and experience of selling property. At Keylet we are able to provide an experienced team that will understand your local market and current conditions. The value of your house is affected by market conditions, and the number of buyers currently looking in your area. Ultimately, your house is worth what a buyer will pay for it. What is the valuation process? Once we have attended the property, we will consider every factor from age and size right through to additional extras such as garden and parking space. The local market needs are also taken into account, looking at comparable recently sold and on-market properties, and what type of features are higher in demand for buyers. Your motivation will also be considered; as if you need a quick sale then your price will have to adjust to achieve this. Although your needs are the priority, the buyer must be considered when valuing the house as it must be a price that is attractive and generates the most interest in the property. There are online calculators available, which give you an idea of the value of your home, this will help set your expectations, although not always accurate. Every property sale is different. Each has its own individual characteristics and different factors which affect the speed of the sale. Due to the complex nature of these transactions, from time to time a number of delays can stall a sale – arranging the conveyancing to finding the right mortgage. Try and stay motivated, and patient, our sales team will always keep you involved with how the sale is progressing. What are the costs involved with selling and moving? There are a number of fees to consider when selling and moving, our sales team will quote you the fee we take for the actual sale of the property, and this will be included in the agreement you sign. The solicitor and financial advisor will also require a fee, it is worth budgeting in all the other things as well, including removals, changing your utilities and insurance for your new home. The sales fee will be taken out of the money you receive for the property. What do I need to do ahead of viewings? Make your property as attractive as possible. Have a thorough clean, and de-clutter the property. You would be surprised to see the difference that a touch of paint makes. For more information on getting your house ready for buyers visit our home staging advice page. We also would love to find out about all the special things at your property that have made it a home. Let us know of both positives and negatives so we can address these with the buyer. Should I take a lower offer from a cash buyer? The advantage of a cash buyer is that they are financially able to proceed without relying on the sale of a house to complete. This means that you will be able to move forward with your sale, and subsequent purchase, with minimal delay. As with many of these decisions, you will need to weigh up whether you can realistically afford to accept the lower offer. What are the risks of a chain? With a chain your sale or purchase relies on other transaction to go through. For example, the buyer of your house will not be able to complete until they have sold their current property. Chains can be a number of transactions long, as there is no set limit to the size of the chain. The risk of this is that chains can fall through, or be delayed, by transactions down the line. We will help manage the chain on your behalf to ensure that all deals go through. Due to the nature of chains, some of the properties may be listed with other estate agents, and therefore information may be restricted. Can I negotiate the price up? You can negotiate any offer you receive. It is likely that the buyer will test your resolve with a slightly lower bid initially. This may not always be the case however as the buyer may be so keen to purchase your property that they offer the asking price. If this is the case then you should consider the benefits of accepting the offer, or whether you are bold enough to ask for an increase. If I accept this offer, how long will it take to complete? On average, it takes around 8-12 weeks to complete following the acceptance of an offer. During this time the new mortgage for the property will need to be agreed, any searches will be carried out and the solicitors will need to be instructed. What do I do if I have more than one offer? This is a great position to be in, consider your options and the pro and cons of each offer. One may be a cash buyer with a lower offer and another could be tied into a complicated chain. Whilst we can provide you with all the information of each buyer and advise you on the strengths and weaknesses of each offer, ultimately the decision comes down to you. I have received an offer but haven’t found a house yet, what do I do? You have a few options at this point. You can continue your search, hoping to find the right home. You can reject the offer, in the belief that you won’t find your new home. Or you can look into selling your home and moving into a rental property whilst you continue your search. Please be aware that, even after accepting the offer, the sale takes on average 8-12 weeks – so you still have time to find a new house. Why have I not received any offers? There are a number of reasons this may occur. It may be a market starved of buyers, it may be that your house is not ticking the right boxes or it may be that your pricing structure is not correct. We can provide advice in the ways in which you can make your property an appealing prospect to potential buyers. What do I do if the offer is too low? The offer represents what the buyer believes to be a good offer. They may just be testing the water, so you are in a position to decide whether to accept, negotiate or reject the offer. We aim to get you the best deal, without overpricing you from the market. Although you may have your own valuation figure in your head this may not reflect the current property market. When will they change the For Sale board to Sold STC? We will do this as soon as possible. Expect the board to be changed within two working days by our external contractors. When will I exchange contracts? The exchange of contracts will usually take place in approximately 6-8 weeks. During this time the solicitor will need to be instructed, any mortgage arranged and surveys carried out by the buyer, or their mortgage company. You can then expect to complete two weeks after this. Do I need to speak to a solicitor/financial advisor? Yes, speak with our solicitor about your impending sale so they begin preparing the necessary documents. You should also speak with your current mortgage provider, as well as any lender that you may be using for your next home. Getting this process underway early is advisable, to avoid any delays or complication. How will I know what’s happening? Your solicitor and our team at Keylet will keep you informed at all times. If you are anxious, do not hesitate to contact us and we will be happy to update you. We can keep you up to date via phone or email, just let us know. With the exchange of contracts so close you may want to think about your moving preparations – for instance, redirecting your post, cancelling your utility bills etc. What does the exchange of contracts mean? This is the point at which the transaction becomes legally binding. The buyer and seller legally agree to the deal and a date is set for completion. Do I need insurance to exchange contracts? Your contract will stipulate whether you need insurance at the exchange of contracts. In the majority of cases the solicitor will request a copy of the insurance document from the buyer and will not exchange until this is produced. Should I get cleaners in to clean my house? It is your choice what state you wish to leave your house in as the contracts have been exchanged and the deal is legally binding. However, common courtesy would dictate that you keep the property in a nice and hospitable condition. If you require any contractors get in touch with us for a list of our recommended contractors, that can cover all aspects of maintenance and cleaning. When shall I move out? This rests on your next property, if you have this already set up and prepared then you can move out as soon as possible. It is advisable to move out a day or two before the completion date as this will avoid any hassle or clash on the day. In terms of time of day, arrange the move for the morning as this will give you flexibility in case of any delays later on in the day. To register with Keylet Sales & Lettings, you can visit us at our Cardiff Bay branch or call to speak to one of our team of estate agents. Alternatively, complete our online registration form. Let us know what you are looking for and we’ll start matching you to your perfect property. We recommend that you download our Keylet app and set up property alerts, so that when a property that matches your criteria comes on the market, you will be the first one to know about it. We list all of our properties for sales on our website, Rightmove and On The Market. What are the costs incurred when purchasing a property, through an Estate Agent? If you are buying a property through Keylet we do not charge a fee, our cost in providing the service is a fee payable by the seller. Although there will be other costs involved when purchasing a property, such as surveyor fees, stamp duty land tax and solicitors fee etc. What does it mean when properties are advertised as no chain? No chain (or no forward) means you will not have to wait for the seller of the property to find another house to buy, as they are not making a forward purchase that would affect you. In these instances you may find that the sale process is a quicker. Furthermore, buying a property like this removes the potential complications of a chain of lots of people trying to move, things can go at your pace rather than being dictated by other movers. Is there ever an option of buying the furniture with the property? Although this is not very common it can happen. People climbing the property ladder tend to have built up their own furniture and take this with them from property to property. However, there are instances such as sellers emigrating and therefore not in a position to take the furniture with them. Then for example a first time buyer, could be interested in the property and may not have any furniture would therefore benefit from this. Furniture can be sold separately and the seller would tend to have an inventory of items available, which could be charged per item or there could be negotiations of purchasing the property with all the furniture for a higher purchase price. We will always try to specify this option on our property adverts, although sometimes this can be agreed with the seller at a later date. Do I ever have contact with the seller? Sometimes you may have contact with the seller, there is nothing stopping you from having contact and it all depends on the situation and is at the seller’s discretion. For example if we are advertising a property for sale that is not in Cardiff, the sellers will often conduct the viewings themselves. On the other hand some sellers ask for no contact, in which case we work between solicitors and other companies to ensure a smooth process of purchase. Properties are purchased all year round, and year from year the ‘property season’ can vary. We often find patterns with the season, in particular people like to sell at summer and therefore stock is at its best, moving homes is a lot easier in good weather, however we find buyers are quieter this time of year due to summer holidays. There is always a peak after Christmas, as well as Easter, however you can be assured that we always have a healthy stock of properties for you to view. I also have a property to sell, should I market this the same time? Yes, if you need to sell to move on we would advise that you instruct a selling agent at the same time that you start to view. As part of a chain offers may not be accepted until your property is sold (in order for the chain to work). You may have to withdraw your property for sale off the market if you can’t find a property to buy, or alternatively you could sell your property as no chain and let a property until the right one comes along. I want to buy a property to let, is this process any different? If you are an investment landlord or looking to get in to the buy to let market it’s worth taking a look at our buy to let guide. Keylet offer a fully experienced Sales team that can help you with the purchase of your buy to let property, and once this is completed and exchanged our resourceful lettings team will be able to advertise your property for rent and manage the property on your behalf. The buy to let process can be quicker if there is no chain. What is the help to buy scheme? Can I benefit from it? Help to Buy is a scheme that allows eligible purchasers to buy new build homes with assistance from the Welsh Government. There are two options available, which are Mortgage Guarantee or Equity Loan which means you can potentially move home with a deposit as little as 5%. It is worth noting that if you use this scheme to purchase a home, you are not able to sub-let. For more information check out our Help to Buy guide. What’s the process should I wish to purchase a property off plan? Keylet Sales & Lettings have plenty of experience when it comes to new developments, you only need to see the ever-changing cityscape of Cardiff and see there are lots of property to be bought ‘off plan’. You can take a look at our development projects in our portfolio, to see we are one of the leasing agents in this field. You must pay Stamp Duty Land Tax (SDLT) if you buy a property or land over a certain price in England, Wales and Northern Ireland. The current SDLT threshold is £125,000 for residential properties and £150,000 for non-residential land and properties. On average, the length of time it takes to purchase a property can vary and no two transactions are the same. We find that it usually takes around 8-12 weeks before contracts are exchanged, but this can vary depending on several factors and if the property is involved in a chain. How much deposit should I be expected to pay? You should expect to pay around 10% of the purchase price, however your mortgage advisor may say it’s less or more depending on the mortgage deal they find you. If your purchase is dependent on a sale, your solicitor will typically use your buyer’s deposit for your related purchase. Should I arrange my mortgage before I start looking at properties? If you know that you will need to take out a mortgage in order to buy your property, then it makes sense to seek financial advice at an early stage. Your mortgage advisor should be able to find you the best deal at the time based on your circumstances, they will then provide you with a ‘Mortgage in Principle’, this can then be used to prove to seller or estate agent that you have the necessary funds in order to finance your purchase. What happens if someone else wants the same property as I do? From time to time, there may be an instance whereby we have conducted several viewings on the property and a number of parties are interested in the property. At this stage we would invite everyone to put their offer in, we then forward these offers to the buyer. There may be room for negotiation here but bearing in mind you are essentially bidding for the property against other like-minded buyers. Our usual procedure would be to ask for best and final offers on a sealed bids basis, which we then forward to the seller for a final decision. At this point we would ask that other factors related to the purchase would be made clear to the seller e.g. cash buyer, part of a chain etc. How should I go about choosing my solicitor? If you have a solicitor who you know can work quickly and efficiently where conveyancing of properties is concerned, you can continue to use that firm. However, if you have any doubts we can confidently recommend one of our excellent solicitors. Will I need to get the property I want to buy valued? If you are arranging a mortgage, then your lender will appoint a Valuer to inspect the property. However, this will often not consider the condition of the property in detail, so you should not rely on this report alone. Depending on the age and condition of the property, it might be best to get a Full Structural Survey, because if problems are found with a property after the exchange of contracts, the seller is not liable and as the buyer, you will have to pay for any necessary repairs. If you are buying a new build property from a developer, then there is greater statutory protection. The surveyor found a problem with my property, what are my options? However, it is important that you refer to the valuation section of the survey as any work needed may have already been taken in to account. What if I decide I don’t want the property anymore? Prior to exchange of contracts, either party is able to withdraw from the transactions. However, once contracts have been exchanged, remedies for ‘breach of contract’ would be available for the suffering party. At this point, the seller would be able to keep your deposit. A house sale or purchase becomes legally binding at exchange of contracts. The solicitor for both parties will hold signed contracts – if either party fails to honour the obligations, this will constitute breach of contract. Do I have to come in to the office to sign the contracts? Exchange of Contracts is the process whereby all the parties in the chain commit themselves. Their Solicitors will telephone other Solicitors in the chain and promise to put their own clients’ contract in the post that day. The parties themselves do not need to be present. When do I find out what date I can move in? The date set for you to move into the property, known as ‘completion’, will be agreed with your seller during the sales process. This date is usually confirmed by the Solicitors. We recommend at least one week between exchange and completion, to give all parties time to pack etc. If there is no chain, or if all parties are set to move, the exchange and completion can happen on the same day.